The International Society for Transgenic Technologies (ISTT) is pleased to announce the approved co-sponsorship of the Mouse Sperm Cryopreservation satellite workshop, organized by Jorge Sztein (NIH, Rockville, MD, USA) and Jesús Martínez Palacio (CIEMAT, Madrid, Spain), both ISTT members, in Barcelona (Spain) on 10 June 2013, within the activities associated to the 2013 FELASA-SECAL Congress in Barcelona, Spain, 10-13 June 2013. The main objective of this workshop is to acquaint students on reliable methods of mouse sperm cryopreservation, Jax and Nakagata, without requiring appliances or large investments to establishing a program at their centers. This course involves manipulation of animals and LN2. “Yale scientist Francis Hugh (Frank) Ruddle, a pioneer in genetic engineering and the study of developmental genetics, died March 10 in New Haven. He was 83 years old“. This is how a text in memoriam of Frank Ruddle, who passed away last Sunday, begins, at the Yale University web site. 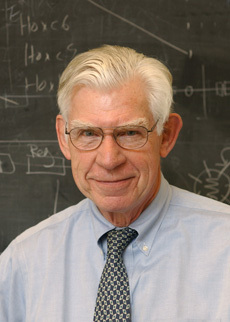 Frank Ruddle was Professor Emeritus at the Department of Molecular and Developmental, Yale University. In collaboration with Jon W. Gordon, from the Mount Sinai School of Medicine in New York, at the time one of his post-docs, Frank Ruddle devised and succeeded in creating the first transgenic mice, the first animals genetically modified after microinjecting a plasmid DNA into the pronuclei of fertilized mouse eggs. These seminal papers were published in 1980 and 1981. In order to remember Frank Ruddle’s pioneer contributions to the field of transgenic technologies, to highlight the relevance of their findings among our youngest colleagues, and to adequately assess, in perspective, their fantastic achievements, made more than 30 years ago (or only 30 years ago, depending how you would like to see the case) I am citing here the full abstracts, as they appear published in their respective journals, PNAS (in 1980) and Science (in 1981). Gordon JW, Scangos GA, Plotkin DJ, Barbosa JA, Ruddle FH. Proc Natl Acad Sci U S A. 1980 Dec;77(12):7380-4. Integration and stable germ line transmission of genes injected into mouse pronuclei. In summary, they injected some heterologous DNA into the pronuclei of fertilized mouse eggs. This DNA was eventually covalently associated with the host DNA (integrated) and was also successfully transmitted to the progeny of the resulting genetically-modified mice (transgenic), therefore it was inherited as a new DNA piece, a new genetic trait, thereby creating a new mouse strain, a new animal model, a trangenic mouse. Isn’t that splendid and beautifully simple? Indeed, but someone had to envisage first the experiment, someone had to carry out the injections successfully. Someone was first in demonstating this was actually possible. This was Frank Ruddle. On behalf of the International Society for Transgenic Technologies (ISTT) I want to express my most sincere condolences to his family, colleagues and friends. This is a great loss for the transgenic community. 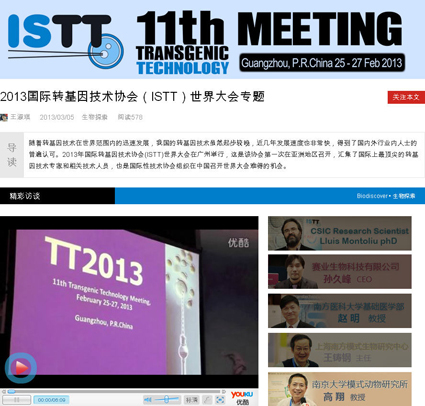 The recent and most successful 11th Transgenic Technology (TT2013) meeting, held in Guagnzhou (China) on 25-27 February 2013 and organized by Prof. Ming Zhao (Southern Medical University)l, on behalf of the International Society for Transgenic Technologies (ISTT), has been reported, commented and covered by pictures, videos and TV- interviews at the most popular and visited Chinese science-oriented web portal biodiscover.com. Footage includes TV-interviews to Prof. Ming Zhao, Chair of the TT2013 meeting; Prof. Xiang Gao, Director of the Model Animal Research Center of Nanjing University, Nanjing, China; Prof. Zhu-gang Wang, Director of the Shanghai Research Center for Model Organisms, Shanghai, PR China; and Dr. Lluis Montoliu, President of the ISTT, among other. Immediately after the Chinese Spring festival, the Chinese New Year’s celebrations, the ISTT family was gently bitten by the Chinese snake. The 12th Transgenic Technology meeting, TT2013, held in Guangzhou, the capital of the province of Guandong, inaugurated the year of the snake, in the Chinese calendar. Ancient Chinese wisdom says a snake in the house is a good omen because it means that your family will not starve. People born in the Year of the Snake are keen and cunning, quite intelligent and wise. They are great mediators and good at doing business. Therefore, all the popular Chinese signs already indicated we would be enjoying a very successful and lucky TT2013 meeting. And, I’m most glad to say this was indeed the case!. The ISTT family and newcomers we all enjoyed an excellent conference where all invited speakers contributed extensively to this success, sharing their latest and most exciting results in the field of animal transgenesis and triggering interesting discussions. The quality of the talks was excellent and, noteworthy it was impressive to learn and discover how advanced and innovative to different aspects of the genetic modification of animals our Chinese colleagues are and have been progressing, thanks to a clear support from their Chinese Government and institutions. The influential Chinese science was represented at this TT2013 meeting by several top scientists in their respective field, using rodents, livestock or fish as experimental animal models, and all working in China, including: Qi Zhou, Jinsong Li, Xiang Gao, Bo Zhang, Liangzue Lai, Depei Liu, Guo-Liang Xu, Ning Li and Zhu-Gang Wang. Ming Zhao, the Chair of the TT2013 meeting, from the host institution, the Southern Medical University of Guangzhou, worked very hard, leading a large group of local collaborators that brought the TT2013 conference to a success. The TT2013 meeting kicked off with a pre-meeting dinner, at a cruise upon the Pearl River, another majestic snake with multiple branches that crosses the city of Guangzhou at many locations. As soon as the darkness covered the city we discovered numerous impressive buildings and bridges, nicely illuminated with colorful neons, dominated by the Canton Tower, an outstanding communication tower more than 600 meters height. The TT2013 meeting took place at the Baiyun International Convention Center (BICC) in Guangzhou, a gigantic conference center holding hotels, restaurants, seminar rooms and anything a meeting venue would require. We only occupied a small fraction of one of the five dedicated buildings of this enormous conference complex, and everything we needed, the seminar room, the exhibitor’s hall, the poster boards and the eating and drinking places were tightly and nicely grouped into one single location. Furthermore, most of TT2013 delegates were also lodged in one of the two large hotels of the BICC complex. Therefore we had everything we required handy and concentrated. About 350 delegates gathered for the TT2013 meeting in Guangzhou, including representatives from 31 exhibiting companies that sponsored the conference and, hence, decisively contributed to its success. All sponsors must be praised for their most generous support. The conference included talks from 33 invited speakers, coming from many countries around the world, from Europe, America, Australia and Asia, thus highlighting the well-known international soul of the Society, also regularly reflected at the TT meetings. TT2013 participants were coming from as many as 27 different countries. Such phenomenal enterprise could not be managed without the devoted hard work of Ming Zhao’s large group of collaborators from the Southern Medical University, led by W. Chen, Xianyan Liu, Bibo Liang, Xiangguang Wu and all the rest of young and helpful students appointed by the chair of this conference. Their committed work must be acknowledged and commended. In Guangzhou, at the TT2013 meeting, the 9th ISTT Prize for outstanding contributions to transgenic technologies, generously sponsored by genOway, was awarded to Allan Bradley, Director Emeritus of the Wellcome Trust Sanger Institute (WTSI), in Hinxton, UK, and leader of the Mouse Genomics Team at WTSI. Upon receiving the ISTT Prize, he delivered a great inspirational talk about his personal journey over three decades (1980-2013) on embryonic stem cells technologies he had the privilege to witness and be part of it from the first row. In awarding this ISTT prize to Allan Bradley, the ISTT Prize committee acknowledged his many fundamental contributions to the science and technology of manipulating the mouse genome. His pioneering mouse embryonic stem (ES) cell work in the 1980’s, demonstrating germ-line transmission and the great potential of ES cells to generate mice carrying mutations in endogenous genes, established milestones in a field that saw the award of the 2007 Nobel Prize in Physiology or Medicine to Capecchi, Evans, and Smithies. Later, he generated a number of broadly relevant knockout mouse models that are still used regularly today. His subsequent research has developed new methods for the genetic analysis and genetic modification of mice. These developments have been instrumental for advancing mouse genetics studies and the use of mice to understand the human genome. Furthermore, his strong vision and leadership at the Wellcome Trust Sanger Institute, which he directed from 2000-2010, was key to creating the international consortia whose aim was to systematically disrupt every gene in the mouse genome, resulting in a massive impact on the field of transgenic technologies. 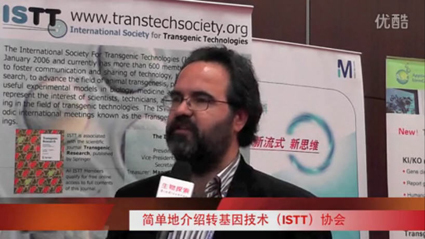 In Guangzhou, the sponsor of this ISTT Prize, genOway, was represented by Yacine Cherifi. Another important award that has rapidly gained prestige and recognition among the youngest researchers and technologist in our field is the ISTT Young Investigator Award. The ISTT Young Investigator Award recognizes outstanding achievements by a young scientist who will keep the field of transgenic technologies vibrant with new ideas and who has recently received his or her advanced professional degree. The ISTT Young Investigator Award is generously sponsored by inGenious Targeting Laboratory (iTL). At the TT2013 meeting in Guangzhou, the second edition of this ISTT Young Investigator Award was received by Toru Takeo, from the Center for Animal Resources and Development, Kumamoto University, Japan. The Award committee considered that Toru Takeo’s work, in Naomi Nakagata’s laboratory, represented a major improvement of mouse sperm cyropreservation and IVF techniques, thereby greatly facilitating the archiving and sharing of many mouse models produced by the transgenic community. Toru Takeo summarized his recent achievements in mouse sperm cryopreservation and IVF with a very interesting talk where he highlighted the value and uniqueness of receiving a combined training in Pharmaceutical Sciences and Reproductive Biology, leading to his successful use of several drugs and compounds that have boosted sperm cryopreservation efficiencies in mice. In Guangzhou, the sponsor of this ISTT Young Investigator Award, inGenuious Targeting laboratory, was represented by Ailan Lu. At the end of the TT2013 meeting, as it has become a tradition in the closing ceremonies of TT meetings, since the TT2015 meeting in Barcelona, it was the time to reveal and present the next venue for the following conference, the 12th Transgenic Technology meeting, TT2014, which will be held in Edinburgh, Scotland, UK. Bruce Whitelaw (Roslin Institute, University of Edinburgh) and Douglas Strathdee (Beatson Institute, Glasgow) represented the local Organizing Committee (the third Organizer, Peter Hohenstein, could not attend the meeting in China). Douglas Strathdee, Chair of the TT2014 conference, introduced their vision and aims for the TT2014 meeting in Edinburgh, depicting a combination of well-consolidated sessions, already classical at TT meetings, with some interesting innovative challenges, including an increased number of short oral presentations, Poster teasers and a practical workshop on zebrafish transgenic technologies. Additional information for this TT2014 meeting will be regularly available from its corresponding web site: www.tt2014.org. The Organizers have already activated an official TT2014 meeting email address to receive suggestions, inquiries, comments and any request of information related to this conference: tt2014@transtechsociety.org. Finally, last but not least, once the TT2013 meeting was finished, immediately next, the relay was passed to Liangping Li and Wenhao Xu, who, together with Jing An and Ming Zhao, organized a practical hands-on transgenic workshop, hence fulfilling one of the most important missions of our Society, that of teaching, forming, educating scientists and technologies with the latest methods in the generation and analysis of genetically-modified animal. This practical course was chaired by Wenhao Xu and hosted by Liangping Li, at the newly refurbished and excellently equipped Disease Model Animal Center of the Sun Yat-Sen University in Guangzhou, one the biggest and most prestigious universities in China. 30 participants attended this 2013 Transgenic Workshop and were taught by a team of generous instructors from various countries in the world, including ISTT members and delegates from the sponsoring companies. A variety of microinjection techniques were discussed and performed by the participants, including DNA embryo pronuclear injection, laser-assisted injection of ES cells, piezo-assisted ICSI, non-surgical embryo transfer, colony management and assisted reproduction techniques, among other useful methods in the daily work of a modern transgenic facility. In summary, the TT2013 meeting and 2013 Transgenic Workshop in Guangzhou, China, have been again two most successful and memorable events. On behalf of the International Society for Transgenic Technologies (ISTT), I can only express my deepest appreciation to Ming Zhao, Liangping Li, Wenhao Xu, Jing An and the rest of members of the local organizing and advisory committees for having put together such a wonderful conference and practical course, thereby maintaining and further expanding the highest standards and quality of the TT meetings series. Alison Cameron, our ISTT administrative assistant, deserves here to be greatly acknowledged for her instrumental collaboration during the preparation of this TT2013 meeting and workshop and for her helpful contribution to the success of this first visit of the ISTT family to Asia. We can conclude by stating that, yes, the ISTT family was gently bitten by the Chinese snake, and this resulted in a rewarding and unforgettable experience.